Scientists group cockroaches, Praying Mantids, Grasshoppers, Crickets, Katydids, Stick Insects and some other insects together as Orthopteroid Insects. They are closely related and have many common characteristics. Orthopteroid Insects are from medium to large size. Usually they are green or brown in colour. Camouflage is common in Orthopteroid Insects. All of them have their chewing mouths. Most of them are plants-eaters except all Praying Mantids and some Katydids are predators. Adults Orthopteroid Insects have four wings, the front wings, knows as tegmina, is tough and narrow when compare with the hind wings. At rest, the hind wings folded, covered and protected by the tegmina. Most of them can fly but not a very good flyer. The fright is mainly achieved by the broadly opened membranous hind wings and the tegmina will give only little help. They are all develop in incomplete metamorphosis and their young, the nymphs, look much the same as their adults excepts smaller and wingless. Later instars will have wing buds but still cannot fly. Not all cockroaches are ugly. This bush cockroach look beautiful. Their body is brown to dark brown with with white pattern. 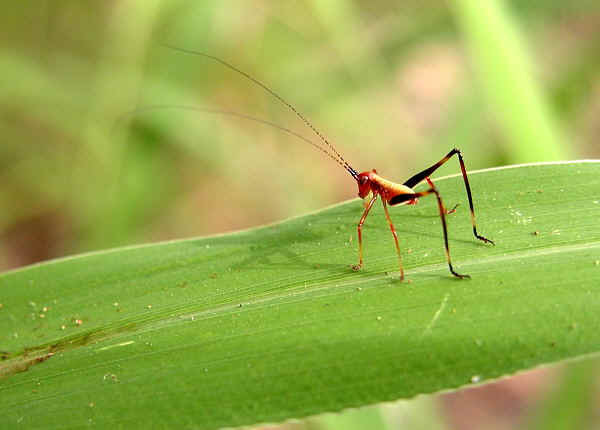 They have long legs, slender body and with antennae longer than the body. Their body is usually flat and broad. They may have or no wings. Mantids are predators to other insects, with strong forelegs which have spines. They have strong mouthparts for chewing. Their eyes are large and well apart on each side of their mobile head, so that they can locate precisely their prey at close distance. Their hind legs is highly developed, much stronger and larger than the other four legs. They are very good in jumping. The adults insects have four wings, the front wings, knows as tegmina, is tough and narrow when compare with the hind wings. Stick insects are large to very large. They tend to resemble sticks and twigs, usually they are brown in colour. Some of them are green in colour and look like leaves. They spend much of their time hanging motionless in plants.